This year King Concepts has seen a significant increase in the demand for HiPERFLOOR within commercial and industrial applications. Tired of high maintenance and short lifetime flooring the search for a floor that can deliver what it promises often stops with King Concept’s HiPERFLOOR. With the demand for concrete flooring solutions on the rise it seems apparent that as demand increases, so does an individual’s choice of alternatives. Concrete is evolving as a medium, which provides unparalleled advantages in design flexibility, longevity, strength, low maintenance, hygiene and cost effective flooring. 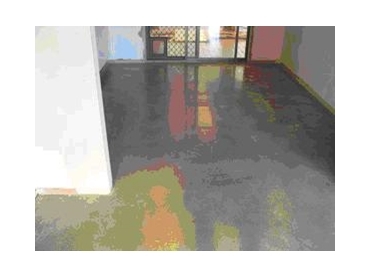 Gone are the days of coatings and sealers for concrete flooring applications.These products offer end users a relatively short lifespan, discolouration over time, scratching, chipping, general wear, installation and continual maintenance down time. For clients in Commercial and Industrial environments, factors such as the above impact heavily on the long term price and effectiveness of a floor. Significant cost and effort is directed to daily maintenance of floors with the use of chemicals, degreasers right down to heavy abrasives being the norm to remove grease, dirt etc. HiPERFLOOR eliminates the need for these extra cleaners with a simple neutral pH soap, water and an auto scrubber or mop to bring the floor back to its original condition. King Concepts’ HiPERFLOOR is not a coating but a method for mechanically grinding and polishing old and new concrete floors. HiPERFLOOR is not only a method for protecting concrete floors, but a process for turning a concrete floor into a highly abrasion resistant, smooth and visually appealing surface. In a recent retail project, HiPERFLOOR was chosen not only for its cost, abrasion resistant and longevity advantages, rather also for its light reflective properties. With limited natural light the highly ground polished slab was able to yield an increase of at least 35% additional reflected light, compared to its coating and sealer counterparts. The actual light reflecting back into the facility transformed the atmosphere of the complex into an airy and spaciously positive environment. Further additional benefits of the HiPERFLOOR system making it particularly attractive to Commercial and Industrial applications, include its odourless application and environmentally friendly properties (VOC free), no longer do staff or clients need to be removed from the premises due to toxic smells or fumes. Furthermore, unlike sealers and coatings which require significant drying time, HiPERFLOOR can be installed without the costly down time normally associated with those products. For a polished concrete solution for flooring, HiPERFLOOR brings out the beauty of concrete, combining it with the unparalleled advantages of easy maintenance, eliminating the need for epoxy or thin film coatings. A floor that will improve over age rather than deteriorate, guaranteeing a surface that can withstand even the toughest traffic and add years to the expected life of the floor.